Paris, 1967, Specimen einer Action de 50 Francs, o. Nr., 27,1 x 19,6 cm, grün, braun, türkis, KB, lochentwertet. 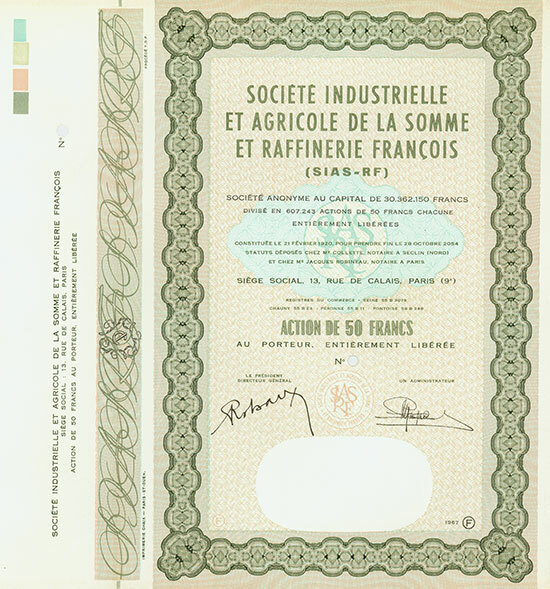 Paris, 1967, Specimen of Share of 50 Francs, no number, 27.1 x 19.6 cm, green, brown, turquoise, coupons, hole cancellation. Die am 12. Februar 1920 gegründete Gesellschaft betrieb die Zuckerfabrik Bernot, die Werke Buchoir und Hombleux sowie die Chemiefabrik Mesnil-Saint-Nicaise. The company was incorporated on 12 February 1920. It operated the sugar plant Bernot, the plants Buchoir and Hombleux, as well as the chemical plant Mesnil-Saint-Nicaise.